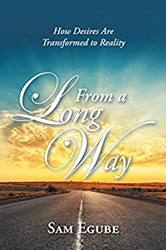 “From a Long Way: How Desires Are Transformed to Reality” is an autobiography of the eclectic businessman, counsellor, and author, Sam Egube. The book gives the full account of a life of ups and downs, as well as the mistakes and bold moves. Egube’s life story shows undiluted details of growing up in the southern region of Nigeria, the misadventures of love, the rigidity of rule-based Christianity, and more. It also shows how a corporate man went from working in suits, to working as a bus driver and refuse dump coordinator, and how he bounced back, taking the Oil and Gas Division of the Nigerian banking Industry by storm. “From a Long Way” shows how the author transformed his desires into wealth and true happiness. The book discusses how people can change outcomes by taking a stand, the dynamics of relationships, the power of persistence, how affirmations can change individuals, and how your desires can become reality. Sam Egube is a principal investor and business consultant for entrepreneurs and CEOs. He previously worked for decades in the banking industry in multiple high-level positions for which he has earned many awards. Egube has also published two other books books, “Thoughts from a Wealthy Perspective,” and “Relationships Are Value Propositions.” He currently lives in Nigeria with his wife and children. To learn more, please visit http://www.fromalongway.com.